I originally shared this recipe on Cooking with Ruthie. 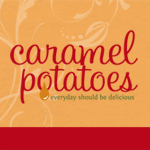 There is just something about Caramel and Apples that makes me absolutely drool! I love the combination of apples and caramel. 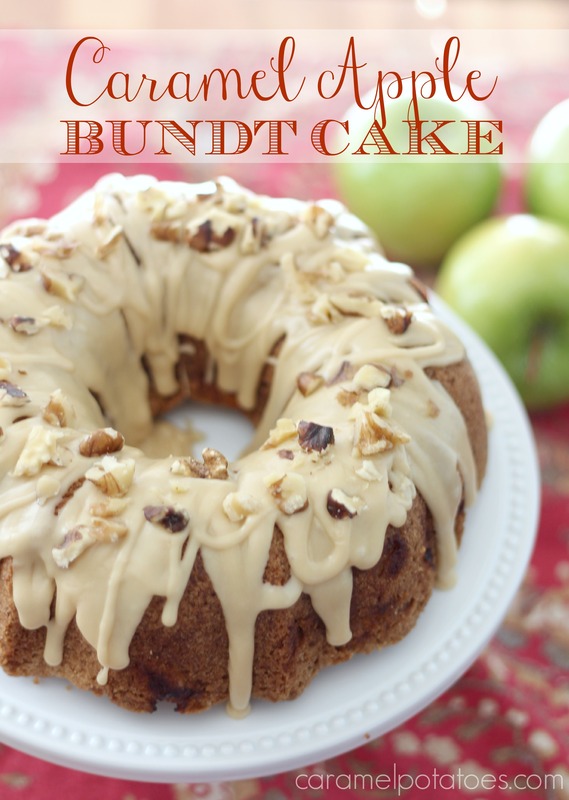 I also love Bundt Cakes, so Caramel Apple Bundt Cake is perfect for me! This long-time family favorite cake is so moist and is incredibly delicious. 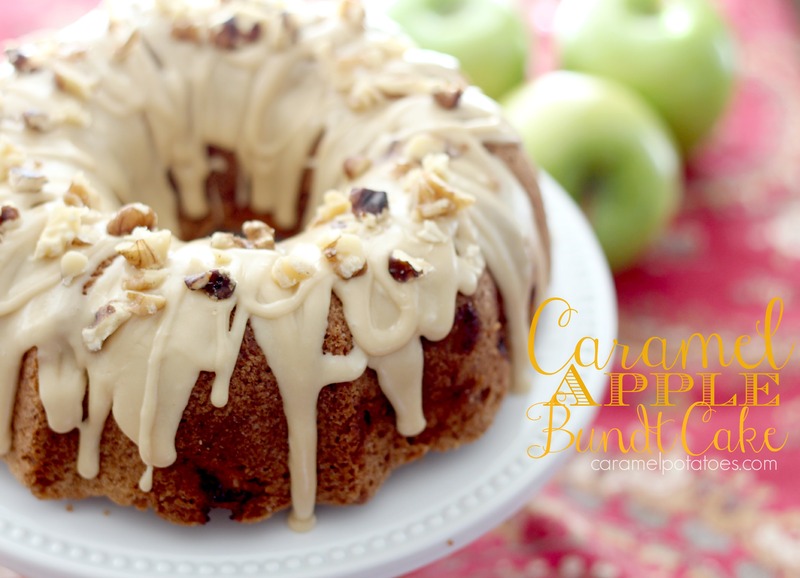 It’s filled with fresh apples and spices, but as if that isn’t enough, it’s also topped with a creamy caramel frosting and sprinkled with nuts! One more great thing about this cake is that it gets more moist on day two or even day three, so I can make it up ahead of time. I even like to freeze them to pull out for the holidays! Pack this cake to a picnic, or it is definitely pretty enough to serve on your holiday dessert table. It’s also fabulous on your brunch buffet. No matter where or when, it’s sure to be a huge hit!! Preheat oven to 325 degrees. Grease and flour a 10-inch bundt pan, or use a cooking spray containing flour. 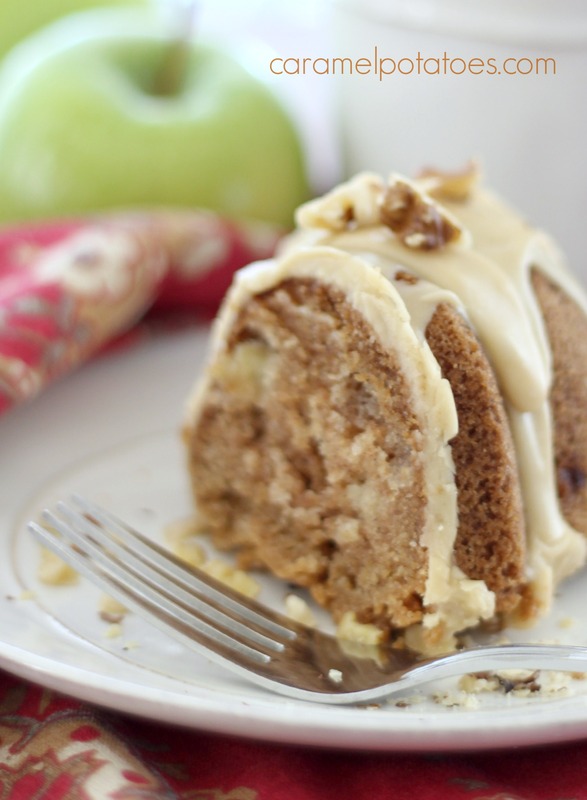 To make the Apple Cake: Combine the flour, cinnamon, nutmeg, soda, and salt and set aside. Place the sugar, brown sugar, and oil in the bowl of electric mixer. Beat at medium speed until the mixture lightens, about 2 minutes. Add the eggs, one at a time, beating after each. Add the vanilla and combine. With a wooden spoon, stir in the flour mixture until combined. Fold in the apples and nuts if desired. Transfer the batter to the prepared bundt pan. To make the Caramel Frosting: In a medium sauce pan, heat the brown sugar, butter, and milk, whisking constantly over medium heat, until it boils. Remove from heat. Stir in the vanilla and allow to cool about 10 minutes. Stir in the powdered sugar until you reach a consistency that you can spoon over the cake. Note: you can add more milk if you would like a thinner frosting. Spoon the frosting over the cake and allow to run down the sides. Sprinkle with chopped nuts if desired. *This cake gets more moist with time. If you want you can make it a day or two ahead and then frost before serving. You can also wrapped the cooled cake and freeze for later. This looks scrumptious! We are going apple picking tomorrow–what great timing.